Add oil to the skillet over high heat, and heat it until small hairline ripples appear on the surface of the oil. Break the eggs into tall glass or frappe cup and whisk to blend for 1 minute. While moving the skillet in a circular motion, pour in the eggs. Continue to move the skillet in a circular motion, allowing the outside of the eggs to cook and fluff up. When the outside edges have firmly cooked, flip the omelet and cook on the other side for approximately 30 seconds. Keep moving the pan in a circular motion, but not as often as before it was flipped. (Too much movement at this time will cause the omelet to fall.) Flip the omelet once more to finish cooking--no more than 30 additional seconds. Overlap 2 slices of American cheese in the center of the omelet in a diamond shape. Top with filling ingredients. 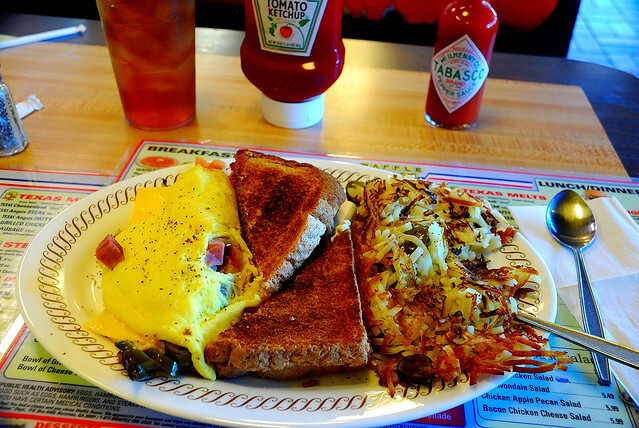 Fold the omelet in half, being certain to cover the cheese slices, and slide it onto your plate.